That headline generates disturbing images, on a number of levels. But it neatly summarizes the apparent point behind a lengthy profile of GOP strategist Karl Rove in the current issue of New York magazine. The piece, titled "Goddangit, Baby, We're Making Good Time," is written by Joe Hagan. A source told me in advance that Hagan is a Rove sycophant, and after reading the story, my source clearly was on target. Six "key takeaways" on the Rove profile are nicely summarized at theweek.com. But you have to get to the last paragraph of the New York story before finding the No. 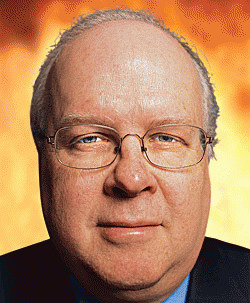 1 takeaway: that Rove is salivating over the thought of Jeb Bush running for president in 2012. And thanks to the Obama administration's dismal record on justice issues, Rove is free to help put another member of the Bush crime syndicate into the White House. The woman, Karen Johnson, is a lobbyist rumored to have been Rove's mistress before his divorce from his second wife in 2009. When she tells him they've already reached the exit for Junction, -Texas, Rove is impressed: "Goddangit, baby! We're making good time!" So, Rove is driving around Texas with the woman who broke up his second marriage? No wonder this guy appeals to "values" voters.